If the Instagram algorithm freaks you out, I get it. Many creatives are worried about the algorithm, not really sure how it works or why they see a drop in engagement. So first, let me start by telling you; that if your engagement has dropped, it might not be because you´re doing something wrong, or because people are not that into you, it simply means that Instagram is the fastest growing social media platform, and that competition reduces your reach. That´s a fact we cannot change, so we just got to make the best of it. When it comes to the Instagram algorithm, everyone seems to have a theory about how it works. I often see Instagrammers posting negatively about the algorithm, making warnings and pleas for engagement. It stresses and confuses their followers, ending up creating falls belief about what Instagram is doing. So if you´re tired of not knowing where the gossip ends and the truth begins, this post is for you. 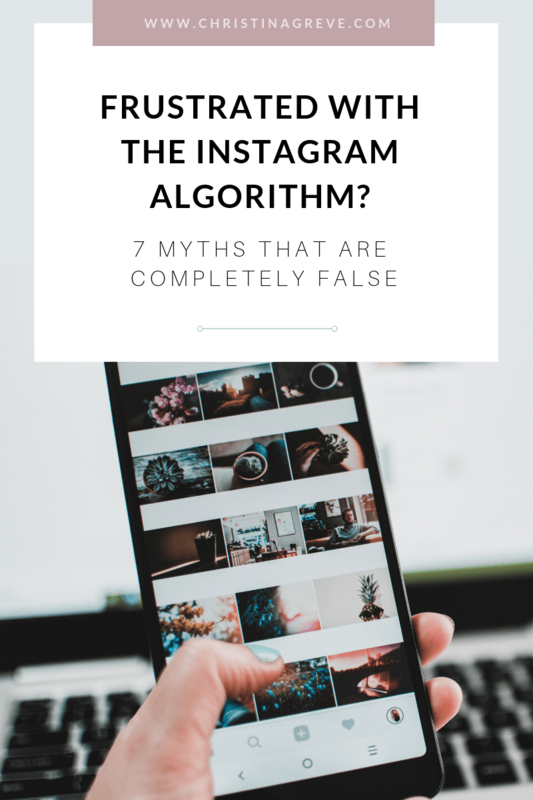 I decided to do some research of my own and today, I`m diving into some of the most popular myths about the Instagram Algorithm and share what I discovered. Hopefully, it will give you the clarity you need to continue posting on Instagram with a happy + calm mind. Are you ready? Let’s demystify the 7 biggest myths about the Instagram algorithm! This myth is one of the biggest concerns I hear from my community, and the good news is; this is simply NOT true! There´s been plenty of gossip about the Instagram algorithm and how it only shows a few percentages of your content to your followers. Some even claim that the algorithm limits posts to showing only 7% or less. So here´s the truth; Instagram never hide posts from people – if you keep scrolling, you will see them all. I think the real issue is that people don´t keep scrolling for very long, because let´s be real; people are busy. So that means that followers end up interacting with maybe the first 10-30 posts they see. And if they are following hundreds of accounts, it will be difficult to see and interact with ALL posts of everyone they follow. I was recently teaching a workshop, and one of my dear students took out her phone and showed me her Instagram account. She then pointed out a specific photo in her grid and asked: “Why didn´t you like this photo Christina?” She was wondering why I didn´t like that photo because I normally like her photos. She thought I had seen it and scrolled passed it. But the thing is when you follow 500+ accounts as I do, there´s no way to see ALL photos every day. My time is limited. I don´t want to live my life on Instagram, and therefore I only have time to interact with a few people every day, and those will always be the first images I see in my feed when I open up Instagram. And that brings me to the real secret; engagement is key! What shows up first in your feed is determined by what posts and accounts you engage with the most. The only followers missing out on your posts, are the ones that don´t interact with you or that you don´t interact with. The best thing you can do, to grow engagement is to stick around Instagram after you´ve posted. Personally, I never post to Instagram unless I know I have time to stick around for about an hour after. For me, it´s important not just to dump a photo, but to be present and give back. So right after I´ve posted I will stay on Instagram, liking pictures, commenting and most importantly reply to the comments on my photos. This will also boost engagement right after you post, which shows Instagram that your post is worthy of reaching more people. Valuable engagement; longer, meaningful comments and conversations back and forth, also signals to Instagram that your content is worth spreading + it builds connections and real relationships. And when you build relationships and interact with the same people often, you will be sure to see what they post first. Once again, the answer is NO! Isn´t that just wonderful? I´ve had a business account for a few years and I´ve seen no negative impact on performance – only positive growth. Simply put; Instagram doesn’t give extra feed presence to personal accounts or business accounts, so switching won’t help your reach. I´m proud of being a business owner. I love my business. To me, it would feel wrong not to be authentic and real about that. 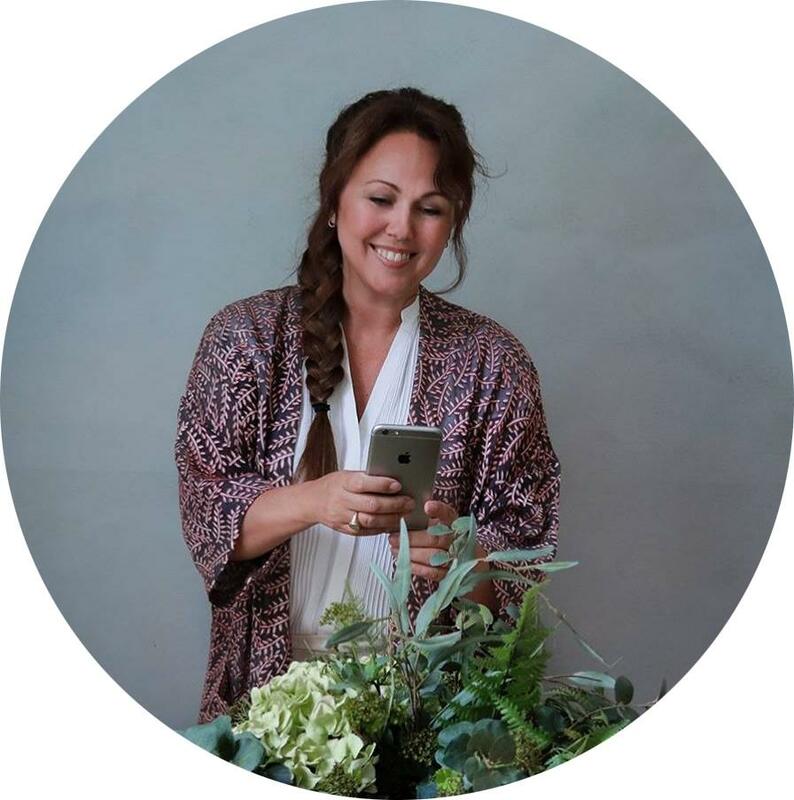 And there are so many amazing benefits of an Instagram business profile, like having access to valuable analytics, show your contact info (email and phone), and being able to advertise. The algorithm will NOT punish you for turning your account into a business profile. So Instead of spending time worrying about that, spend your time creating helpful, inspiring and heartfelt content. First things first; shadowbanning is not a real thing. Instagram says it doesn’t hide people’s content for posting too many hashtags or taking other actions. There are so many confusions about the do´s and don´ts of hashtags. But this myth is easy to clarify; You can put your hashtags wherever you want. You can put hashtags in the comment area or in the caption area. There really is no difference in their functionality, so it’s your choice. I personally prefer adding hashtags in captions, leaving a bit of white space between my writings and the hashtags. Okay, let me clear this one up once and for all. It´s NOT about the number of hashtags, it´s about the quality of hashtags that determines your engagement potential. I’ve seen so many discussions about this. Some will say that you should use less than 5 hashtags, or that 7 hashtags are the sweet spot for most engagement. It´s just crazy! Instagram allows you to use up to 30 hashtags, so the algorithm is not going to punish you for using all 30 hashtags, okay. I recommend you use at least 11 hashtags or more for best engagement. But you got to pick the best hashtags for your content if you want to grow. Use hashtags relevant to your followers and perfect audience. To do this you need to spend a bit of time doing some research. Avoid the popular hashtags, because your post will be quickly buried in the hashtag feed, and instead find the best hashtags for your audience. Use hashtags that are relevant to your niche and helps you connect with people who are looking for exactly what you’re posting. Also be careful not to use outdated hashtags, that no one is looking at anymore. The best way to stay updated about hashtags is to watch what others in your niche are using. Notice what like-minded friends and influencers are posting on their photos. Check out the related tags Instagram suggests when you tap a tag that’s relevant to your content. This will give you plenty of ideas for new hashtags. A good idea is to write them down so you don´t forget them, and then update your list once in a while. Someone recently told me that the new big thing in order to grow on Instagram is to like a lot of Instagram stories. So instead of just swiping through Instagram stories when you see them, you give out a heart emoji on each and every story. I do NOT believe this to be effective at all. Nor does it help that you are incredibly active on Instagram stories posting 20+ snaps of random stuff and daily life. Stories are a fantastic way to engage with your audience on Instagram, but how little or how much you are on Instagram stories seems to have little effect on the algorithm. So don´t stress about it. Instagram doesn’t favour users who use Stories, Live, or other special features of the app. Again it´s the quality of what you post that matters. My best advice to you is to put some thought into what you post. See Stories, as a separate platform from your normal Instagram feed and create a posting strategy that is unique to your stories. And btw, just giving a like on a story doesn’t do much for engagement. It´s like saying “Hi” to someone on the street. It sure is a friendly gesture, but it´s not what is leading to friendship or networking. If you really want to connect with someone, write them a kind message either in the comments or in a direct message. People will be much more likely to remember you for how you made them feel, and then visit your account, to leave a comment or follow back. You should always do your best to proofread before you post something on Instagram. That being said, you will not be punished for going in after posting to add a comma or changing a word you´ve misspelt. I do it all the time, and I´ve never experienced it to stop the flow of engagement. If you worry about this, feel free to wait a few hours until the engagement on that post has slowed down before you go in and edit the caption. But in reality, it should not make any difference. Another rumour is about the length of Instagram comments, and how they affect your engagement with a follower. According to the rumour, Instagram doesn´t recognize emojis only words. And a similar rumour is that the comments need to be longer than 3 words to “count” towards improving your engagement. Again this is not true! There is no proof that words are weighted heavier than emojis when it comes to writing comments. You can engage just fine with just a few emojis or a quick comment without it hurting your visibility on Instagram. That being said, you should limit your emoji comments to the days you´re really busy because heartfelt comments on posts are extremely valuable. The more effort you put into commenting, supporting, helping and showing interest, the better engagement with your community. And it´s in building a community that you will truly be able to grow your Instagram following. So, instead of stressing about the algorithm, spend your time doing the things that have been proven to grow your Instagram following: creating high-quality content, posting regularly to Instagram, share inspiring Stories, and building a real community on Instagram. And to build a community you have to be active yourself – there´s just no way around it. The less active you are the fewer people will see your posts. The more active you are and the better your content is, the more people will see what you are posting. because the algorithm starts to see some form of a relationship between you and that account. My last tip to you is to remember WHY you started on Instagram in the first place. Instead of focusing on the numbers, the likes and the comments, focus on having FUN, being creative, sharing what you´re excited about and be determined to entertain, inspire, help, educate or add beauty to the world. As long as you touch just ONE person out there in the world, you did a good job. Why? Because that person has friends and research shows that people like to talk about what they see on Instagram and they like to show accounts to their friends. The growth might be slow, but it doesn´t matter much if you make an impact on those that actually follow you already – no matter how small that number is. Do you sometimes feel stuck, frustrated or like things aren’t moving forward the way you want them to? If so, you’re not alone. Feeling like this is super normal. The question is how do you deal with it. Because, how you deal with feeling stuck, insecure or overwhelmed will determine your ability to feel confident and connected with yourself. Your negative thinking patterns seduce you into doubting your own potential and tricks you into playing it safe. Rather than supporting you, your inner critic tells you that nobody cares, that you are not good enough and that it´s best if you keep your head down. Don´t allow any inner bullying. It stops TODAY. Listen to the MiniBoost Episode and set your thinking straight immediately. Can you believe it! We are already at episode number 4. YES! I really enjoy making the show. And even though I still feel very much as a beginner experimenting with podcasting, I absolutely love this way of sharing inspiration and knowledge with you. 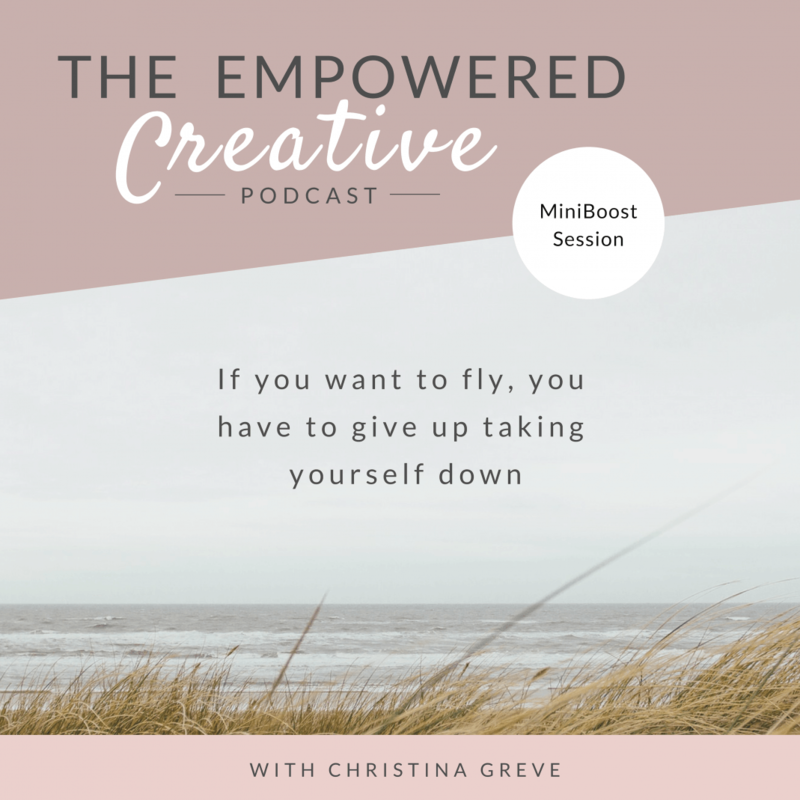 And I´m blown away by all the positive attention The Empowered Creative show has received. It makes me super happy, so thank you so so much for tuning in, subscribing to the show and for all the amazing reviews on iTunes. Just listen to this wonderful review: “Listening to Christina’s podcast is like sitting down with a close friend over a coffee. 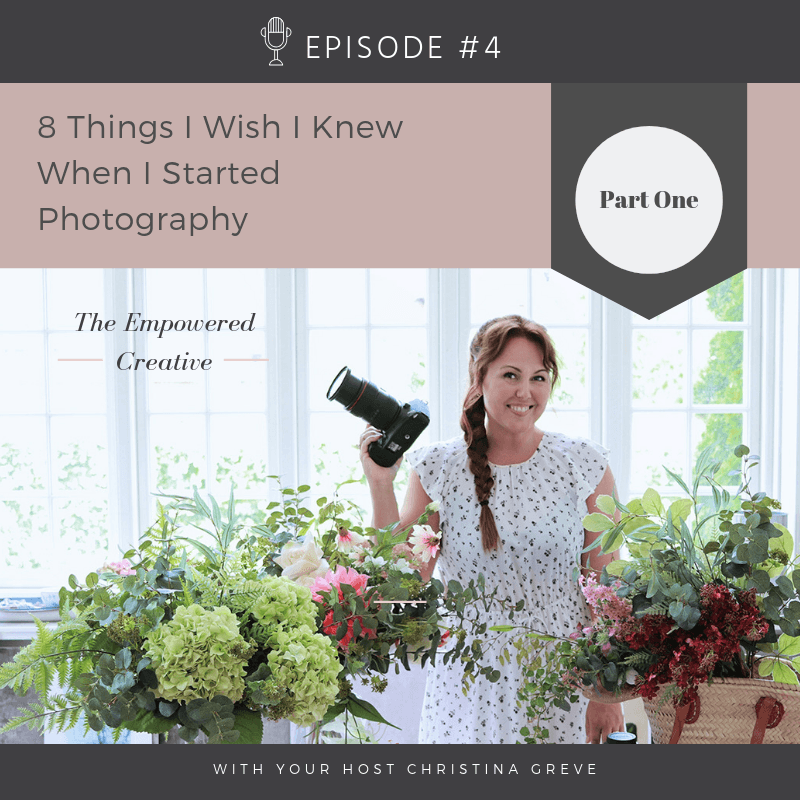 She offers so much actionable advice and encouragement for chasing your dreams. I highly recommend it!” Aww, melts my heart…This review was published by Kate Bragg on iTunes – so thank you kate. I´m just beyond grateful for all your fabulous support. As one of my listeners said to me yesterday; “Christina, I start my day playing your podcast because I learn so much and it puts me in a good mood”. Wow! I think that´s incredible. This is exactly why I make this show; to uplift your spirit, empower your soul and give you strength to grow your creative career. So thank you for being here, thank you for all your support and love. You matter to me and that´s why I do this! For those of you who don´t know my story, I started my photography career back in 2009 and within a year I made the jump from hobby photographer to fulltime photographer. After working with psychology and running a successful coaching business for more than a decade, this was a scary decision to make back then. But at the same time, I had this artistic side in me that felt somehow neglected. When I finally got my first camera something inside of me instantly clicked and I was hooked and the urge to pursue photography became so consuming I couldn´t ignore it. For a while, I was doing therapy sessions during the day, and then I took pictures in the evenings and on weekends. In the end, I was running two full-time jobs and I knew I had to choose because doing both was too much and I needed more time with my family. I chose photography, and I jumped. I had no idea what I was getting myself into. It was all learning by doing and I made so many mistakes along the way. And I´m going to share some of them with you today – raw and real….so I hope you are ready! If I’d only known the things I know now, my first few years as a photographer would have been much more productive and much less frustrating. However, my frustrations and my mistakes are your gain!